It is common for New Zealanders to have a dabble on sports or drop a few dollars at the local casino. We have seen this passtime move online over the past 10 years with more and more online casinos opening their doors to Kiwi casino players. Whilst online casinos and sportsbooks offer players the convenience of playing from home, there are a number of aspects to consider before gambling online. This means that is is completely legal for Kiwi players to gambling online as long as the casino is based outside of New Zealand itself. The fact that the online casinos are not based out of New Zealand means that it is difficult for players to know whether they can trust the casino or sportsbook. There is also very little recourse for a player when dealing with scam casinos based in foreign jurisdictions. There are a couple ways to determine the trustworthyness of an online casino. The first is to do your research and check online casino reviews. You should also check to see where the casino is licesnsed. Casinos licensed out of locations like CuraÃ§ao are often not as trustworthy as ones that have licenses from Malta or the UK. Casinos that have European licenses have far more reglatory oversight and are required to respond to player complaints. It is now possible to play at most reputable casinos in NZ$. This is fantastic news for Kiwis as it means that you no longer have to pay currency exchange fees. Many banks will charge a minimum conversion fee as well as a percentage which often exceeds 1%. This means that if you want to place a 100 USD bet you will often have to pay a minimum of around 8NZD + 1% which means that it would cost you and additional 10 NZD to play. This conversion fee would again be applied when transferring the USD back to NZD. Playing in your local currency also help you know exactly how much you are betting without needing to monitor exchange rates. Online Casinos, offer players big bonuses to play at their casinos. These bonuses are always subject to stringent terms and conditions. The majority of bonuses you will see require minimum purchase thresholds and are subject to wagering requirements before you can cash out. The wagering requirements can range from 50x your original bonus to a crazy 200 times at some casinos. These requirements are normally put in place to limit players abusing the bonus systems but can also be used for more nefarious purposes too. The majority of online casinos will also ask you to send through “KYC” documentation before allowing you to withdraw from the casino. It is good practice to do this upfront and ensure the casino is happy with the documentation before trying to initiate your first withdrawal. Problem gambling or Gambling adiction can significantly effect people’s lives. There has been little help for people who are effected by problem gambling historically but this has changed in recent years with a number of clinics and government organisations getting involved. Speaking to someone about your (or a loved one’s) gambling can bring an immense amount of relief and help you take control of your life. If you believe you, or someone you know, may have a gambling problem we urge you to take a test and seek professional help. One such test can be found here. 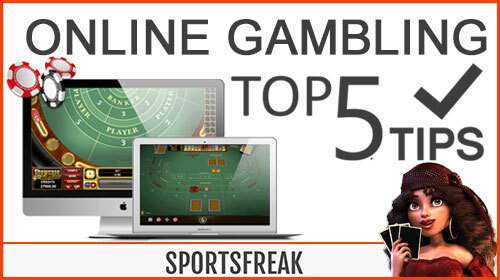 We hope you enjoyed our top 5 tips for gambling online in New Zealand and be sure to leave a comment in the box below if you feel there is anything we missed out.